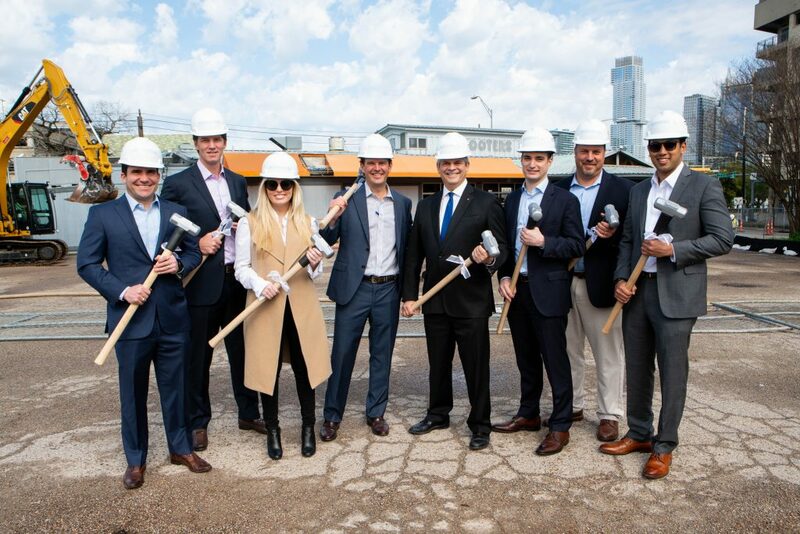 AUSTIN, TX ​– March 13, 2019 – Stream Realty Partners (Stream) today began construction on its signature Austin project, RiverSouth, a 350,000-square-foot, high-end office tower complete with ground-level dining and retail. This milestone was commemorated with a demolition and groundbreaking event hosted by Stream. RiverSouth is replacing Austin’s Hooters, located at 401 South 1st St., on a 1.4-acre triangular tract where Riverside Drive, Barton Springs Road and South 1st St. all converge. The property was informally coined the “Snoopy PUD” because it was formerly owned by the family trust of Charles Schulz, the famous cartoonist behind the “Peanuts” comics. “Exciting to see the South Central Waterfront begin to deliver community benefits and help us pay for pocket parks, clinics, and libraries all over the city,” said Mayor Adler. 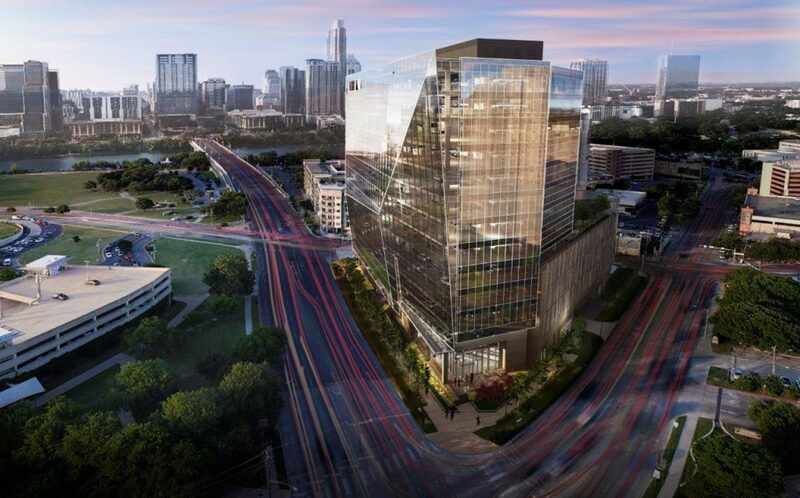 RiverSouth will be a 15-story office development with panoramic views of downtown. It will also offer a green roof, ground-level dining, and retail and world-class amenities for its tenants. The project will include environmentally-friendly features, improvements to the streetscape and active transportation infrastructure in the area, and funding toward affordable housing in Austin. “In May 2018, City Council approved the rezoning for this property after months of Council and community negotiation with the team behind RiverSouth,” said Council Member Kathie Tovo. The South Central Waterfront Vision Framework Plan was approved in June 2016, and the South Central Waterfront Advisory Board was established in July 2017. Austin City Council unanimously approved the Planned Unit Development zoning for the site, with community benefits, in May 2018. 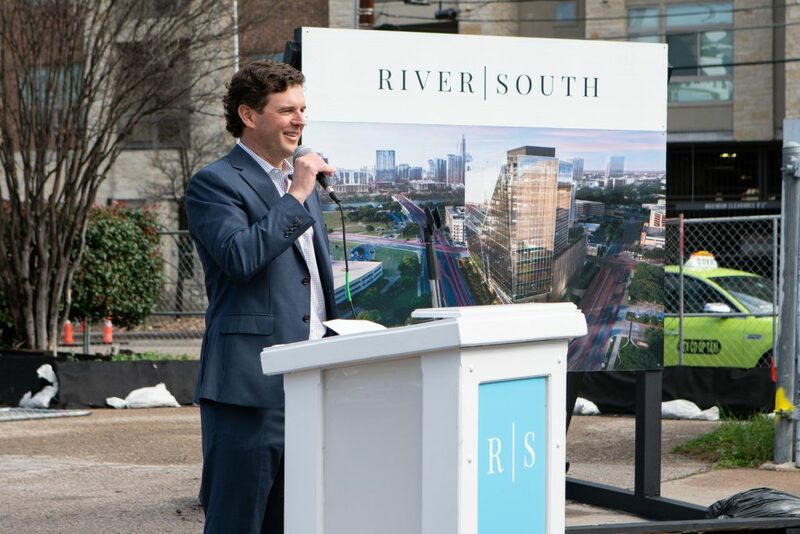 Plans and design for RiverSouth were revealed in September 2018 along with renderings and a website. Hooters’ last day of business was February 3rd, 2019. Stream received its final site development permit on February 15th, 2019, and final delivery for the project is planned for 2021. Renderings, leasing information and marketing materials for RiverSouth can be found at RiverSouthAustin.com​.